Mrs. Crabtree has been teaching third grade at St. George School since 1992. A native from New Jersey, she graduated with her Bachelor of Science Degree in Elementary Education from Lincoln University of Missouri. Several years later she continued her education at Lincoln, specializing in Curriculum and Instruction and earning a Master’s Degree in Education. 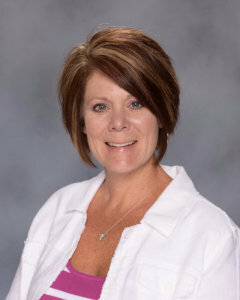 Mrs. Crabtree has had the opportunity to educate hundreds of third graders, including her own two children who are both graduates of St. George School. She believes third grade is such an important year in elementary school because the students are transitioning from learning how to read, to reading to learn. Also, they are becoming young adults and leaders taking on more responsibility. Mrs. Crabtree strives to make every day in third grade the “best day ever” and believes that every child has the potential to succeed.